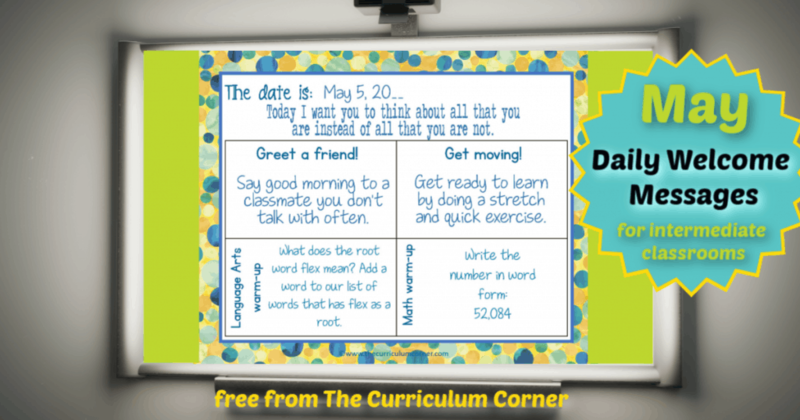 This set of free and editable Intermediate May Daily Welcome Messages is an easy way to get your students to enter the classroom and focus on the day ahead. 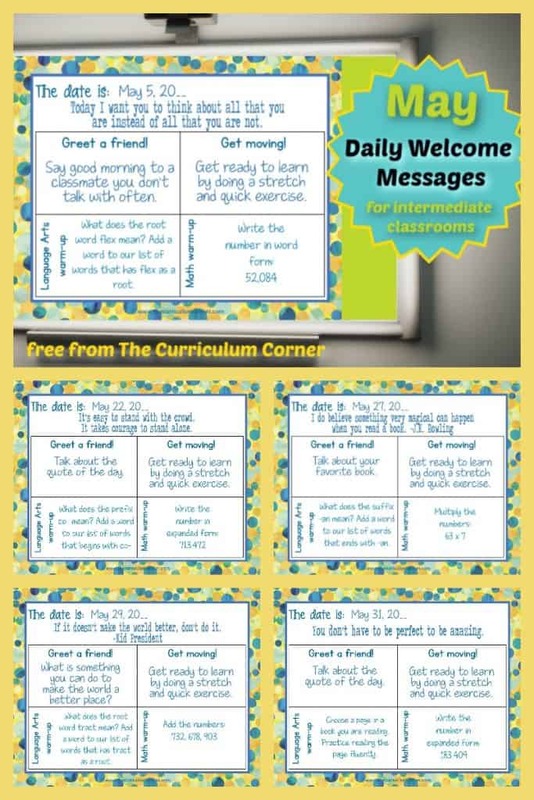 Start your day with these ready to go Intermediate May Daily Welcome Messages! These are geared towards 4th, 5th and 6th grade classrooms. We will be creating a set for each month. This set has been created in a different format than our primary version. Each slide begins with a quote. You might have students discuss this as they enter the classroom. Or, you could use the quote to start your day with a class discussion. You will find a simple get active box asking students to choose a stretch and quick exercise. When beginning these daily messages, it might be helpful to give students ideas for the stretches and exercises. You will find 31 daily welcome messages within this set. We know you won’t use every slide every year but this way you will be set for future years! When we created this set of Intermediate May Daily Welcome Messages, we had a few goals in mind. We wanted to encourage students to talk a little. This is the first thing many teachers do in the morning as they enter the building. Many students want to do the same! We wanted to encourage students to wake up! This is why we included a get active box. We wanted to encourage students to wake up their brains as well! We have included two warm-ups. The first contains a language arts question. The second focuses on math. Now for the exciting part. You will be able to edit the reading and math warm-ups to fit your classroom. The top three sections are not editable. Each slide does include a different language arts and math problem. If you do not have time to edit or forget one day, you will be able to use the slides as they are. We are providing this file as a PDF. You will open the PDF and display the correct day on your SmartBoard. Either choose a student to write in the information about the day, year and weather or allow the first students who enter the room to complete these fill in tasks. We hope these help save you time in the morning and engage your students!